Friedman Fine Art presents historical and contemporary photographs of the sites in Chicago. 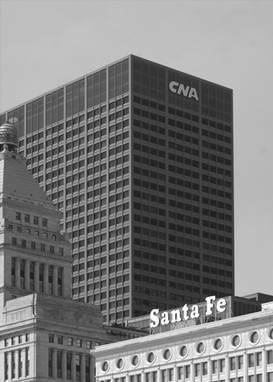 The CNA Center is located one block from Michigan Avenue and the open space of Grant Park, making it stand out. At 333 South Wabash. Avenue in the Loop in Chicago, it was designed by Graham, Anderson, Probst & White and completed in 1972, opening a year later. Standing 44 stories, the rectangular structure was painted red to depict the sun setting over the ocean. In 1999, a shard of glass fell from a 29th floor window and killed a woman walking on Wabash Avenue. It wasn’t the first time glass had fallen from the building. In 1994, glass had injured a man on the sidewalk below. The building had a history of cracking windows for more than 20 years. After an investigation, the building’s owner paid a huge fine to the city and settled the lawsuit filed by the family. All 3,000 windows in the building were replaced with new glass. CNA Financial insurance company still physically checks each window monthly. Today the windows on CNA Center are often used to produce light messages, typically those for holidays and other events. For example, in 2005 there were messages while the White Sox played and won the 2005 World Series. To purchase the photograph or learn about purchasing more of these marvelous photographs.